Black Ice Software - Print2RDP version 6.13 is released! Print2RDP version 6.13 is released! Improved Print2RDP client to select printers during the installation, including stability improvements and more! Black Ice Software has released version 6.13 of the Print2RDP. This version includes Printers selection during MSI installation and Manual installation. This new feature enables system administrators to deploy Print2RDP client for users, by preselecting either the default printer or every printer of the user to be mounted (attached) on the server when the user logs into an RDP or Citrix session on the server. Users no longer need to add printers manually. 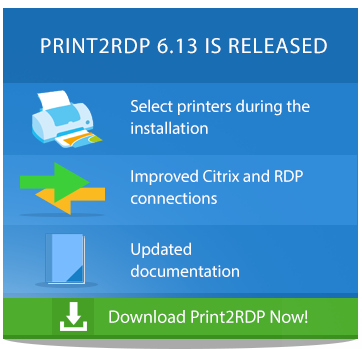 The Print2RDP version 6.13 includes stability improvements for Citrix connections for certain printers with large DEVMODE structures, and also includes stability improvements for RDP connections. Version 6.13 of the Print2RDP includes minor improvements in the installer, and updated documentation to enhance the user's experience. New Add printer(s) with MSI installer for the Print2RDP client.